Swiss owner put Swiss standard hospitality to her beauty salon. The Nail Studio provides for-lady-only world-class services with a range of beauty and skin treatments to all customers in a reasonable price. Here, we opted only quality products such as Ez-Flow, IBD, China Glaze, and Opi. All treatments and services are attentively delivered by certified nail technician and qualified masseuse. 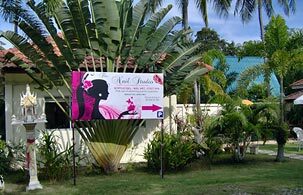 The studio is located in Rawai, South of Phuket Island, amid a peaceful and relaxing atmosphere, surrounded by a lush tropical garden. Swimming pool and its deck have been dedicated to your relieved sunbathing and refreshment, to your trainings and to be your kids playground.